This picture-perfect Maine coastal town, tucked in below Route 1, is a retiring community in more ways than one. By Jeff Clark. On Cape Rosier, nearly every resident tums out to celebrate. Photographs by Lynn Karlin. Scion of America’s first family of artists, James Browning Wyeth finds big inspiration in small Maine islands. By Beth Crichlow. Fifty years after the murder of Maine-born mining millionaire Sir Harry Oakes at his Bahamas estate, the question remains unanswered. By Jeff Clark. Milking from the wrong side was only one of many insults leading to Bossie’s sad demise. By John Gould. Unique photographs record the final glory of an extraordinary Maine estate garden. By Ellen MacDonald Ward. Ogunquit’s Marginal Way, revered by generations of ocean lovers, was the surprising brainchild of an enigmatic nineteenth-century lawyer. By Christine Kukka. A special section on Maine real estate by the Editors of Down East in collaboration with the Maine Association of Realtors. Baby Dog loved this island and me about equally, and her cup runneth over when we were all together. I will testify under oath that when we crossed the bridge at Portsmouth entering Maine after being away for a while she would come suddenly alive, jump over into the front seat beside me, and her eyes would light up with an unholy zeal. By Caskie Stinnett. 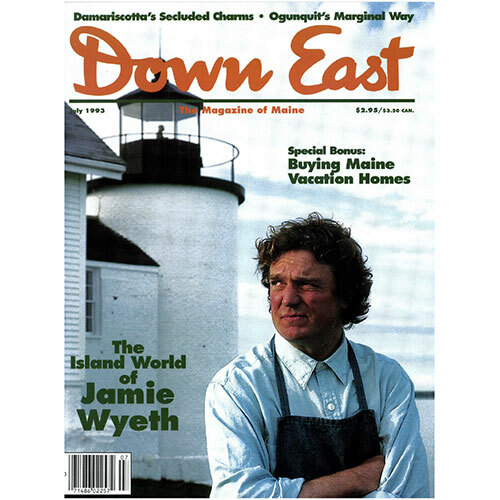 Cover: Painter Jamie Wyeth surveys the watery world of Maine islands from his own private island just off the coast of Maine. Photograph by Peter Ralston.